They start with first heart sound (S1) and end before second heart sound. This murmur has decrescendo configuration. These murmur start after the S1 end before S2 with a crescendo – decrescendo configuration. Called as 50/50 murmur. 50% adults above 50 years have this murmur.This is common in people with hypertension. Murmur is produced due to aortic sclerosis. 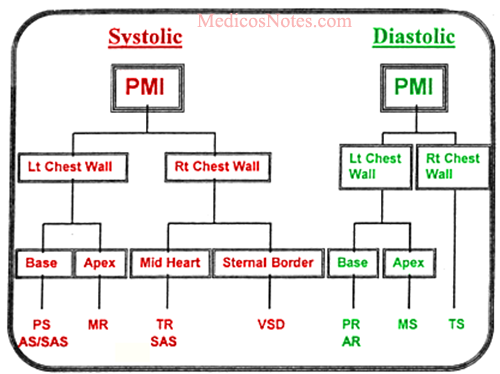 These systolic murmurs start well after S1 and they extend into S2. These murmurs indicate mild degree of mitral regurgitation. They occur due to persistent pressure gradient produced due to abnormal structural or functional communication between two chambers of heart. These murmurs start with S1 and extend into S2. What is the cause of radioradial and radiofemoral delay? What is meant by fall by crisis or lysis in fever ?